Who says all the Russian art money is wrapped up in Bacons and Hirsts…? 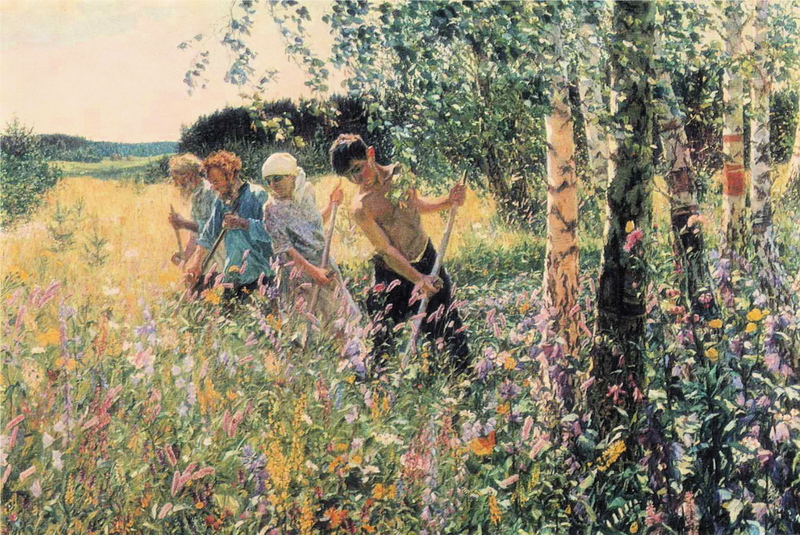 This is one more step on the road to promote the art heritage of the great painter, to preserve the unique creative environment that encouraged Plastov’s talent. The International Artists Exhibition “Plastovskaya osen”, as well as awarding prizes by the name of Plastov, solve one of the most important national issues, such as the preservation of traditions of the great Russian art school. “Plastov’s Award” has become a significant event with an international status. It’s one more emphasis on the intention on cultural cooperation with the CIS, Europe and World countries. “Plastov’s Award” brings together followers of the Master at his homeland to accentuate, that realistic art traditions are alive and have no national boundaries. Submissions for the 2013 Award will be accepted via website, starting in May. This entry was posted in Uncategorized and tagged Arkady Plastov, MacDougall's, Plastov Awards, Russian Art, Russian Ministry of Culture, Sergei Ivanovich Morozov, Sergey Morozov. Bookmark the permalink.